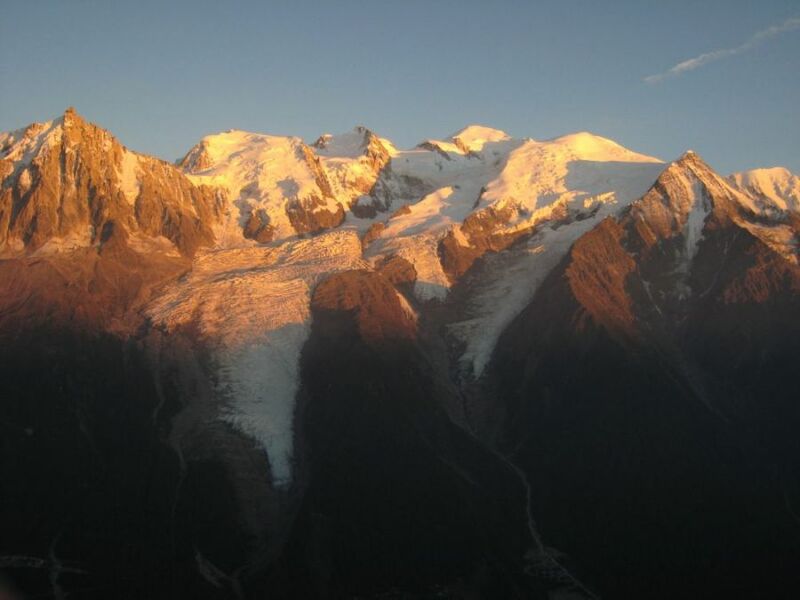 The Mont Blanc massif is famous world-wide for its majestic height and gleaming glaciers. Just to see this mountain range is wondeful, but to hike around it, to discover all its facets and different angles, to experience the mountain cultures of the three countries it borders..this is the stuff of dreams. 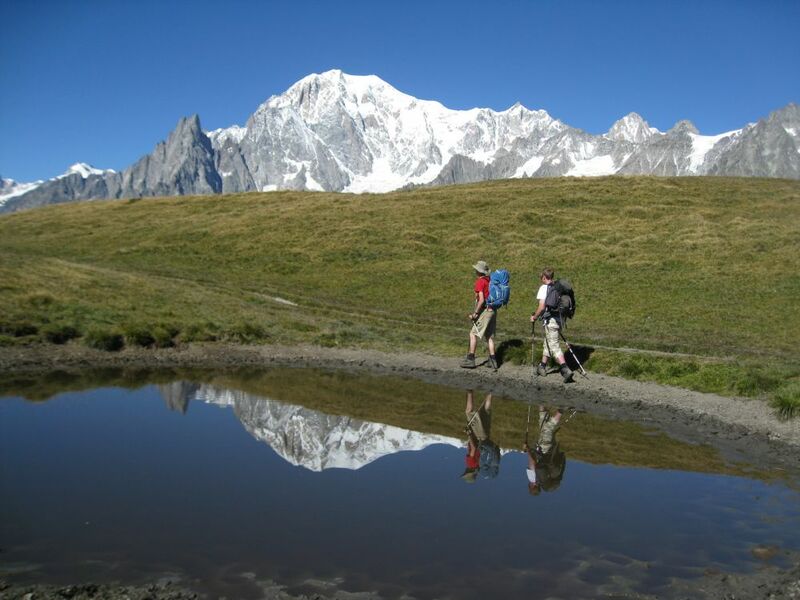 The Tour du Mont Blanc is the best known long distance trek in Europe. In order to circumnavigate Mont Blanc, at 4810 metres western Europe’s highest mountain, the trek passes through France, Switzerland and Italy, in incredibly beautiful scenery - from high mountain passes to charming rural villages to meadows blooming with alpine flowers. It can be done in any length of time really. The 7 day trek I organise takes in several variations on the standard TMB, making it an extremely interesting and varied walk, and avoiding any long stretches on roads. In order to complete it comfortably in the week we use some cable cars and transfers - the cost of these is included in the trek price. MEETING PLACE:Chamonix. Hotel details to be sent on booking. CURRENCY:You’ll need to buy picnic foods, drinks, aswell as souvenirs and postcards of course. Picnics can be bought at each hut and hotel for the next day. Prices vary but expect to pay 10-14€ per day. Also, travel to and from Chamonix. The Euro is the currency of France and Italy and is generally accepted in the Swiss mountain huts and towns on this trek. However, most mountain huts on the trek do not accept credit cards, so please be sure to bring cash. If you don’t wish to travel with too much cash there are ATMs at several places on the trek. EQUIPMENT: A detailed list will be sent on booking. Requirements are basic, and your rucksack should weigh no more than about about 6 kg. I will help and advise you on this. DIFFICULTY OF THE WALK: 2 The Alps by their very nature involve lots of ascents and descents. This trek is of a standard that should be accesssible to anyone who does some regular hillwalking and other aerobic exercise.Expect to be outside for a maximum of 7 - 8 hours a day. This time is NOT spent just walking! There’s plenty of time for rests, taking photos, eating, drinking and, especially, just enjoying the views. However, of course you can expect to be tired sometimes - as always during a walk - and you’ll be walking every day. In the Alps we tend to walk quite slowly - a steady plod is the most effective way of getting up these climbs. This trek is perfect for a first time long distance walk, but will also present plenty of interest for those who’ve already done alot in the Alps. 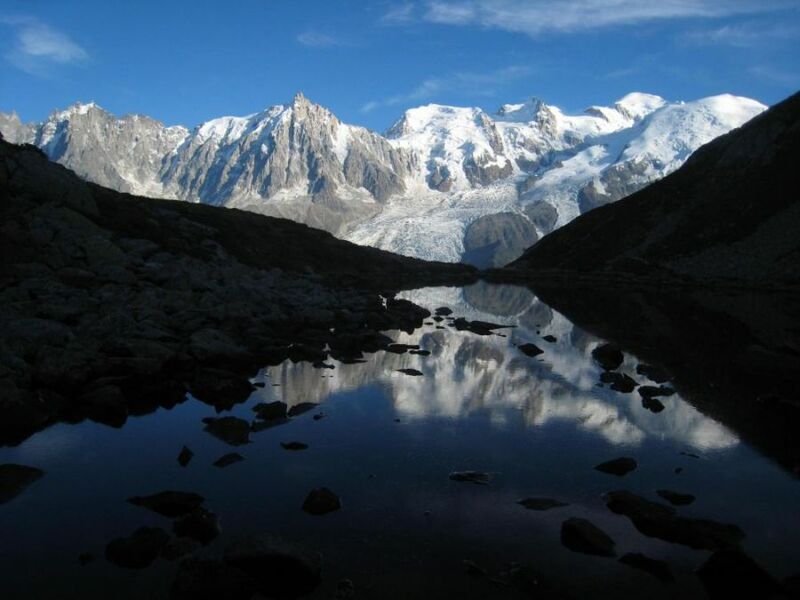 It is particularly fine for its proximity to the glaciated peaks, especially the Mont Blanc massif, and for the interest and variety of walking into different countries. It is justifiably a classic walk.